Virtaal is a software to help you translating any open source software into your language easily. Virtaal is one of the best tool to do contribution for open source commmunity. You can use it for translating software user interface language. User interface language is the language appears in every aspect of your software GUI such as menu, button, notification, tooltip, and so on. You can use Virtaal to translate a software you love the most. I divide this article into three main parts. The main part is the first, how to do translation in Virtaal. The second part is an important part too, how to get the translation file. And the last part, how to send back the translation file you have done to the developer. This article is a global guide. You should be creative to implement it in another project host outside Launchpad. What Software To Be Translated? Try to translate only the software you love. The software you know best. Here are some names. I try to stay focus on Launchpad. You must know a few things about translation technically. String is every aspect of text that can be translated. Usually it is a line, a sentence, a phrase, a word, or maybe a letter. Every software can be translated into another language. Every language in every software saved in a .po file. Every software may has more than one .po file because a software project could be divided into parts, such as the main GUI and the plugin GUI and the documentation and so on. To translate a software, just edit the .po file. Get the .po file in Launchpad. I18N is internationalization, L10N is localization. The numbers represent how many letters between I and N or between L and N.
By GUI, you can search virtaal in Ubuntu Software Center and install it. Left column is original language and right column is your translation place. See that the empty line in the right column is the untranslated string. Select the untranslated line by clicking on the line. You can start from the shortest line. If you don't see any empty slot, you can see your top-left interface, at the Navigation, change the option into Incomplete. This will make Virtaal point you into the untranslated string. 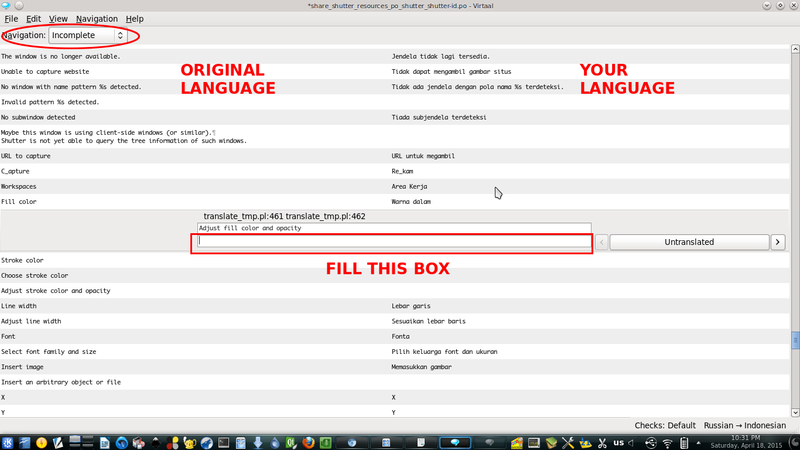 Enter the translation on the empty box. Press Enter to go to next string. Translate what you can. Even it is just 3 lines. Save your translation by Ctrl+S. To get a translation file from Launchpad, you should have a Launchpad account. Log in into your account then follow these steps. I give an example for Shutter translation. Go to the main project page of Shutter in Launchpad. You will visit the link https://translations.launchpad.net/shutter. See right panel. See Help Translate link. This link will bring you into language selection page. You will visit the URL https://translations.launchpad.net/shutter. Launchpad will show you the appropriate language for you. If you are Indonesian, it will show you only Indonesian link to translate. If you prefer another language, click the link View all languages at the bottom-right then select your language. I select Indonesian. This choice will bring you into translation templates page. The URL is https://translations.launchpad.net/shutter/trunk/+lang/id. In the template selection page, you will select whether you want to translate Shutter main interface, Shutter plugins interface, or Shutter upload plugins interface. It depends on the project, so you will experience different templates on another project. I select shutter here. This link will show you Shutter translation page. You will see the address https://translations.launchpad.net/shutter/trunk/+pots/shutter/id/+translate in here. To get the translation file, click the link Download translation at top-right of page. This link will show you the download page of translation file. Keep the option there PO format and click Request download button. Check your email soon. Launchpad sends you the translation file URL address into you email. Download the .po file. In my example, the file name is share_shutter_resources_po_shutter_shutter-id.po. All projects in Launchpad generally have same steps to get the .po file. After translating, you should upload your file into the official project website. In this case, you should upload it back to Launchpad. 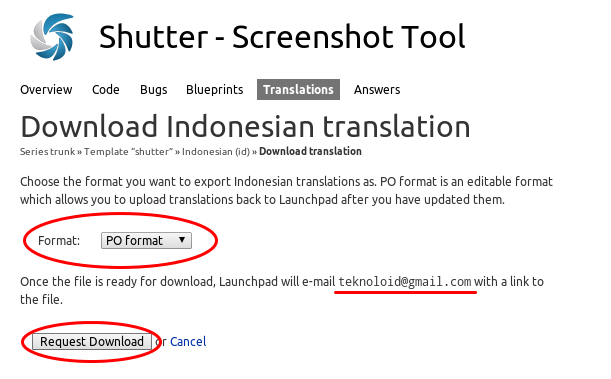 To upload a translation file, you should have a Launchpad account. It depends on the software project, it may require more steps for you to get upload right. But generally, you just need a Launchpad account. Just register to Launchpad and follow these steps. Go to the Shutter translation page. You will visit https://translations.launchpad.net/shutter/trunk/+pots/shutter/id/+translate or such according your language choice. Click the link Upload translation. This link will show you Upload Translation page. Click Choose file button and select your translated .po file. Launchpad will show you a notification in that page. It says thank you for your translation effort. 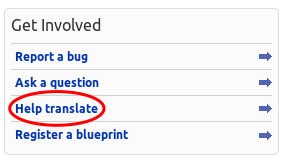 If you want you can see your upload status by clicking Translation Import Queue link. You will visit https://translations.launchpad.net/shutter/trunk/+imports. If you help translating, then you help many users in your country to use the software in their own language. For example, I am a Shutter translator for Indonesian Language. 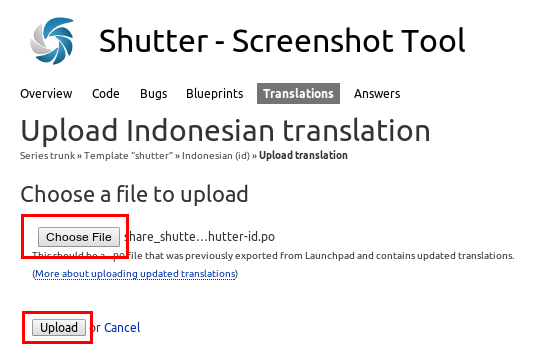 So, Indonesian Ubuntu users can use Shutter not in English but in Indonesian Language interface.